The xenophobic attacks in and around Durban shook our nation and the world, undermining the idea of Ubuntu and our aspiration for an inclusive society. 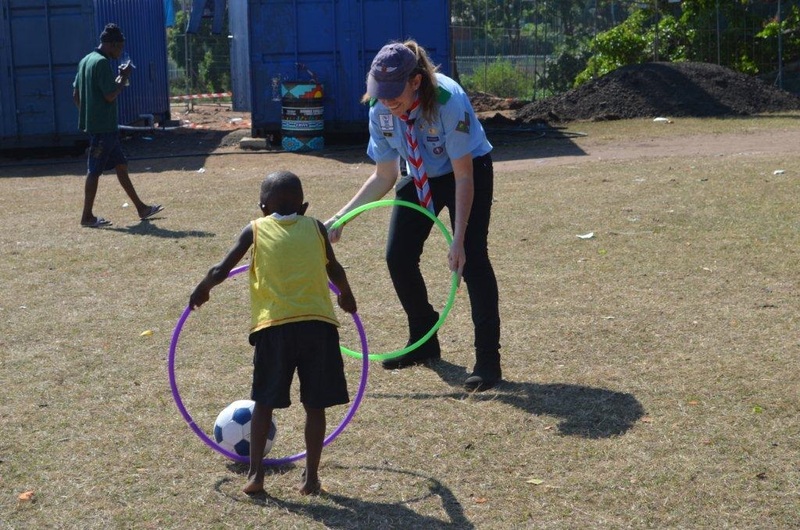 The Scouts in the Durban area took initiative and acted as true Messengers of Peace when they visited refugee camps in a bid to share some smiles and support. The following Saturday KZN Regional Commissioner Steve Camp visited another refugee camp in the area with Cubs, Scouts and Rovers from a number of Scout Groups. The Westcliffe Sports Ground in Chatsworth is home to over 1 600 refugees who have fled to this makeshift refugee camp for fear of their safety. 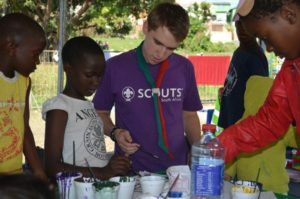 “We wanted to make a difference in any way we could to help these displaced people, to cheer up the children with games and by donating clothing and food that had been collected by many Scout Groups when the call for help went out,” he explains. At the children’s tent the Cubs, Scouts and Rovers were greeted by a group of youngsters ranging from toddlers to 10 years old. Their mothers left early in the morning to go to work, leaving their children with the helpers in the refugee camp. “We first tidied up the area and laid down rubber mats under the shade of the open tent. Then some of the Scouts and Cubs mixed paints and started colouring with the little children. Some Rovers interacted with the smaller kids through build block towers or making jigsaw puzzles. All these are toys which were donated by the Durban community,” explains Steve. “My sincere thanks to all those Cubs, Scouts and Rovers that helped out; who in my humble opinion made a positive difference in the lives of the people we met. 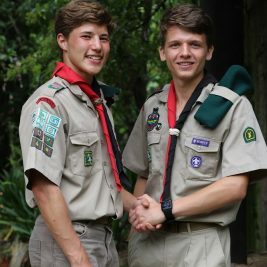 I would also like to thank all Scout Groups who generously donated food, medical supplies and clothing,” says Steve Camp, Regional Commissioner KZN.